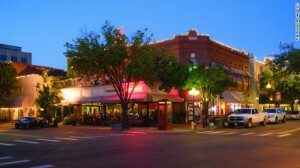 Historic downtown El Dorado provides abundant shopping and dining opportunities. Known as “Arkansas’s Original Boomtown,” the city of El Dorado was at the heart of the 1920s oil boom in southern Arkansas. Today, the city continues to profit from its oil and gas industry, but there is much more to this Golden Triangle town. Visiting the renovated downtown square provides numerous shopping and dining opportunities along with nearby sporting venues, the South Arkansas Arts Center, and even a community college. The city is currently undertaking an effort to invest $50 million into the creation of a downtown arts district. Rich cultural experiences are found throughout the year as El Dorado is home to the South Arkansas Symphony Orchestra and has branded itself as a city of festivals. Some of the festivals that call El Dorado home are the El Dorado Film Festival, the Mayhaw Festival, MusicFest El Dorado and the SouthArk Outdoor Expo. For more information, visit the Festivals and Events page of the City of El Dorado’s website. El Dorado is home to a large number of oil and gas industries, so it is no surprise that the Arkansas Oil and Gas Commission calls El Dorado its home. Publicly-traded companies Murphy Oil, Deltic Timber Corporation, and Murphy USA all find their homes in downtown El Dorado. Lion Oil Refinery is located on the town’s southern border. El Dorado High School seniors participate in “academic signing day” as part of the El Dorado Promise scholarship program. El Dorado became a national spotlight in 2007 when Murphy Oil announced a $50 million gift to create the El Dorado Promise scholarship program. The unique program provides graduates of El Dorado High School with a scholarship covering tuition and mandatory fees that can be used at any accredited university in the country. The city is serviced by the El Dorado School District. A new high school was completed in 2011 at a cost of more than $43 million. The district’s elementary schools are divided into academies, specializing in the arts, the environment, communication and technologies, and math and science. Post-secondary education is available at South Arkansas Community College, a public two-year institution providing educational programs, services and resources for area students. For more information, visit the City of El Dorado’s website.